The text on the image isn’t red for blood — it’s because I tried about seven different colors, and that’s the only one that would show over the image. Why was this movie made? Why, in the 21st century, was there a need to carry a motion to create a $150 million blockbuster based off of a 1960s soap opera? While I admit that there is a section of the fan base that is apparently quite devoted, there isn’t a real interest for Dark Shadows, especially in this capacity. Most who viewed it in its original run have only passing memories of it. What we have is a movie that is misleadingly promising in the first 30 minutes, falling into a deep pit of mediocrity, and then coming back up to impressive entertainment in its last 30 minutes. 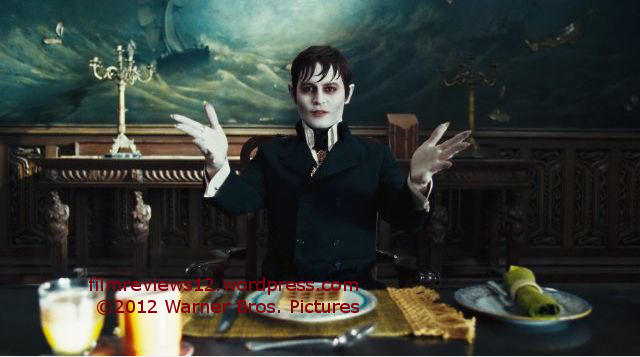 The film starts in the 18th century, where a young Barnabas Collins departs with his family from Liverpool to Maine, and the family sets up a fishing port successful to the point of a town being named after the family (Collinsport). A witch named Angelique (EVA GREEN) was once loved by Barnabas, and after Barnabas falls in love with Josette (BELLA HEATHCOTE), Josette is cursed into jumping off a cliff. When Barnabas attempts to do the same, Angelique turns him into an immortal vampire. He soon falls into a two century slumber, believed to be dead. By 1972, the Collins Estate is debilitated. One entire wing of the mansion is never entered, on account of there only being a few inhabitants. The current matriarch, Elizabeth (MICHELLE PFEIFFER) has a teenage daughter named Carolyn (CHLOË GRACE MORETZ) and a younger son named David (GULLIVER McGRATH), who claims to see ghosts. Also living in the house is an elderly maid (RAY SHIRLEY), a drunken groundskeeper named Willie (JACKIE EARLE HALEY), and a psychiatrist, Dr. Julia Hoffman (HELENA BONHAM CARTER). A woman bearing a striking resemblance to Josette, using the name Victoria “Vicky” Winters, applies to become David’s private tutor (Vicky is also played by Heathcote.). Barnabas awakes in his coffin, and he attempts to decipher the current estate of the family. When news of this reaches Angelique, who is running a rival fishing operation, she takes this an opportunity to finally have him again. The melodrama within makes it an aware and idyllic reference to soap operas in general, and Tim Burton’s visual style is a perfect match for gothic styling. Danny Elfman’s score is stereotypical of him (parts macabre and wit), but a brilliant fit here (and for an inexplicable reason, a motif within briefly reminded me of Randy Edelman’s score for Dragonheart (Cohen, 1996)). The script, by Seth Grahame-Smith, goes for a horror/fantasy riff in the strong beginning and end, and a more comical middle. That more comical middle is where the film really suffers, dragging the 113 minute film down to a near screeching halt, with mildly unbearable jokes about 1970s culture. The scenes where the story or characters actually progress are the only ones worthwhile within this part of the film. Burton lays off of the fantasy tricks here, bringing the dead zone (no pun intended) to an even more obvious front. 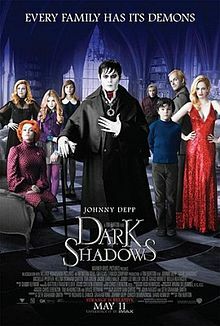 Johnny Depp, in the lead role, tries his best and occasionally succeeds in inserting some life into the second act, assisted by the credible supporting actors. As a whole, Dark Shadows never really finds any footing, constantly cajoling between horror and comedy, and never properly adapting either. While the performances (particularly Johnny Depp’s), the visual effects, and the musical score have the ability to create a satisfying sequence every now and then, Tim Burton’s version of the TV show is just a testament to what happens when money is thrown about without a foreseeable end goal or sufficient energy.